Breakfast: I’m sure you’re getting tired of me saying “Gary got very creative and…”. So I’m going to be more aware of the fact that by now you all know that I live with a creative person who understands the basics of preparing food and applies those basics to the basic recipes we’ve both created here at Responsible Eating And Living. For example, Gary took my basic REAL Corn Bread recipe and literally spiced it up with a strong batch of Chai Tea in place of the liquid and added chopped Apricots and Raisins to the batter to make it better. This is a whole new delightful creation that we’ll be enjoying for the next few days. 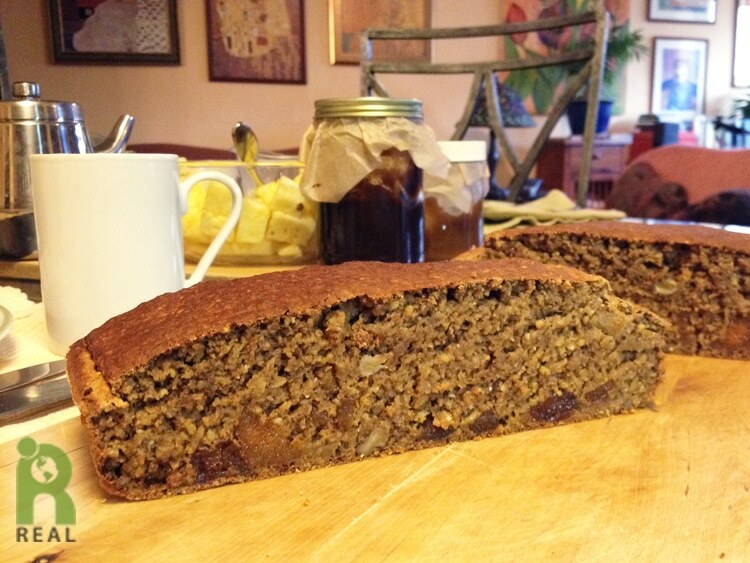 We had the “Chai Tea Apricot Nut Bread” with fresh Pineapple. 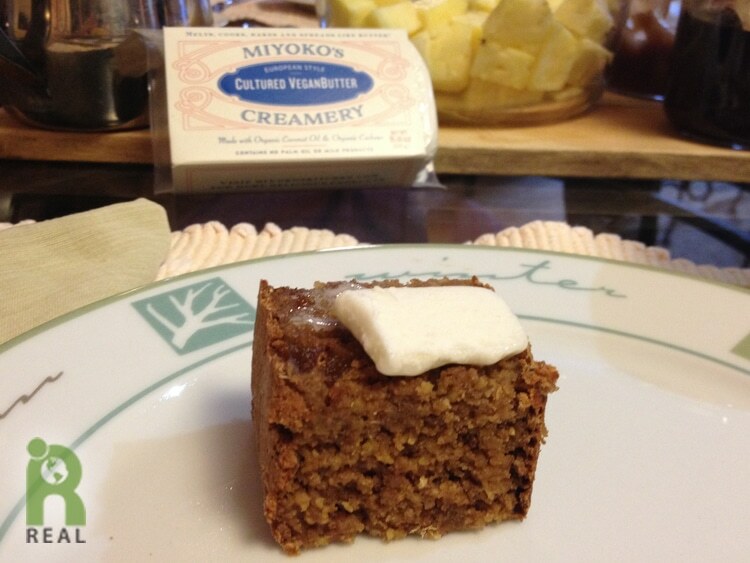 And we had Miyoko’s Creamery Cultured Butter to schmear on the bread. This is good eating. This Cultured Vegan Butter is outstanding in taste. And it’s melts like… buttah! Dinner: We rented a car and headed out to my parent’s home on Long Island for the weekend. 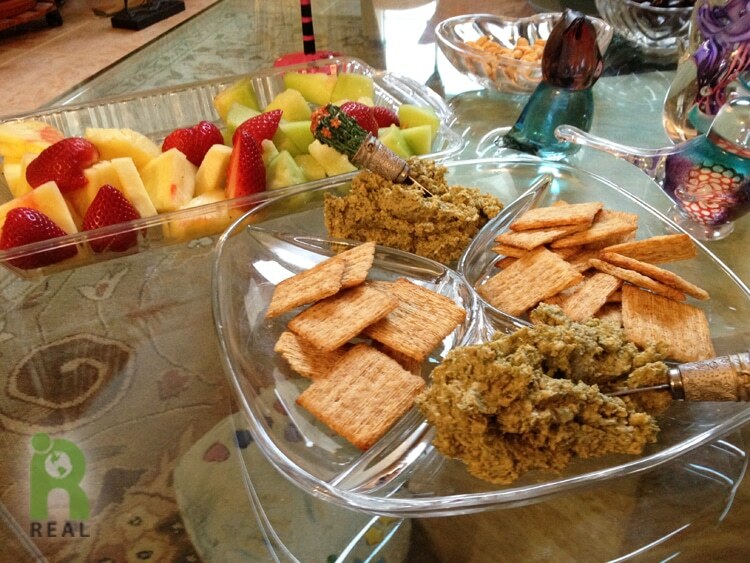 We began as we always do with fresh fruit and my mom’s vegan Chopped Liver. It was exceptional today. Then we went to Jani’s in Huntington Station for dinner. 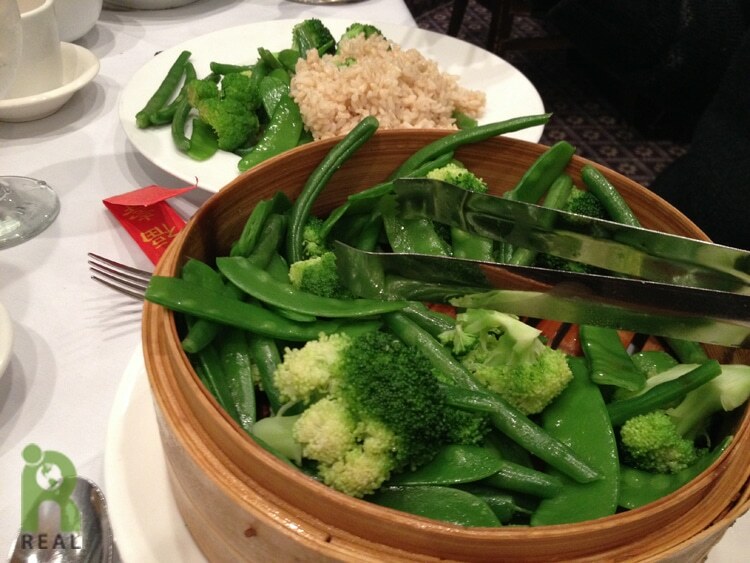 Gary and I ordered the cleanest, greenest dish on the menu: The Green Triple Delight, with Brown Rice. I really love it. We had a pots and pots of hot Oolong tea to go with it. Daily Green Juice:: Gary remembered to bring our frozen green juices made with Kale, Collards, Celery, Carrots.